With tiebreaker in hand over Idaho, the Oilers enter Sunday’s season finale as division champions for the first time since 1975-76. 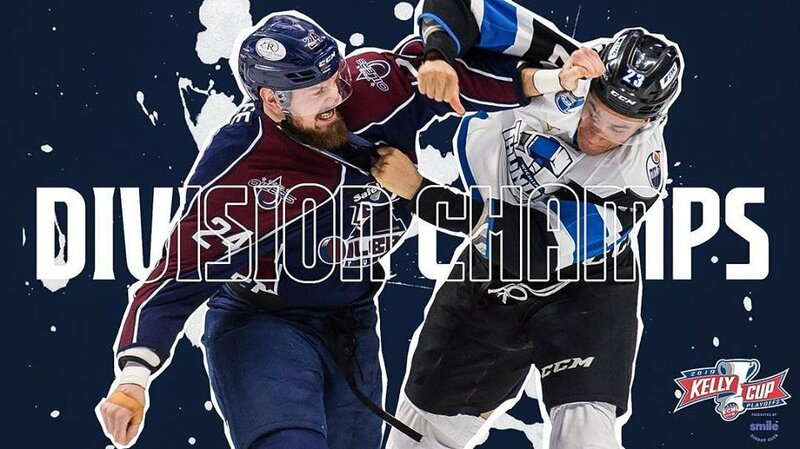 TULSA, OK– Following a pair of wins this weekend against Kalamazoo and an Idaho Steelheads overtime loss Saturday at Utah, the Tulsa Oilers (42-23-6) have clinched the Mountain Division heading into the playoffs. This is the first division championship for Tulsa since the 1975-76 season, when the Oilers won the regular season and playoff championship in the six-team Central Hockey League. The Oilers lead the Steelheads by two points entering the regular season finale, and Tulsa holds the tiebreaker (regulation plus overtime wins). Tulsa will face the Kansas City Mavericks in a best-of-seven series in the opening round, starting next week, with a full schedule to be announced soon. The Oilers wrap up the regular season Sunday at 4:05pm against the Wichita Thunder in the StoneWolf Casino Cup rivalry. Following the game, fans can skate with the players on the ice. First round playoff tickets are on sale now! Game 1 is scheduled for Thursday, April 11 at 7:05pm at the BOK Center, followed by Game 2 Sunday, April 14 at 4:05pm at the BOK Center. Call 918-632-7825 or visit www.tulsaoilers.comto purchase playoff tickets. Follow us on Twitterand Instagram, or “Like” us on Facebookfor more information about the Tulsa Oilers. 2019-20 season tickets are on sale now by calling the Oilers front office at 918-632-7825. Visit www.tulsaoilers.comfor more information.